My interview with Dervla, who will be 80 on November 28 2011, will be published by Wanderlust in the next couple of months, but I could have written twice as much about this delightful and wonderfully eccentric travel writer, so I’m jotting down a few additional quotes and memories here, while they’re fresh in my mind. Many people have stayed with Dervla, or been host to her, during the 48 years that she’s been a writer, and any who visited her during the winter will remember the challenge of keeping warm (“I wonder if it would be possible to have a bath?” I asked on my first visit. “The river’s down there” she responded. It was while bathing in the same river some years later that a frisky bull charged her and broke some ribs – or possibly her back, I can’t now remember). Her hosts remember the challenge of keeping up with her questions: “When we emerged blearily for our morning coffee, Dervla was already, after having listened to BBC since 5am or so, fired up and full of questions we barely felt we could answer. We’re not economists or politicians but Dervla’s questions demanded that kind of substantial response.” (Wendy Woodward, Cape Town.) And we all remember the 5am starts. I recall carefully unfolding myself from the foetal position that I had held all night to conserve heat to see Dervla, bare-armed, carrying child-sized boulders across the patio to build a rockery. Readers of her books will know that a sleeping bag is always a “flea-bag”. More accurately than they may realise. Jock Murray, her beloved publisher, wrote me a note in 1984 to report that she’d just stayed at his house. “Unexpectedly Dervla passed through Cannon Lodge on her way to a British-Irish Conference at Oxford for which she had to wear evening dress – an alarming prospect for which we had a dress rehearsal after she had a bath to get rid of a flea she had picked up in Dublin.” I can just imagine how alarming the evening dress requirement would be. Dervla is not known for her fondness for clothes and she detests formal occasions. Jon Lorie successfully invited her to take part in his annual travel festival. 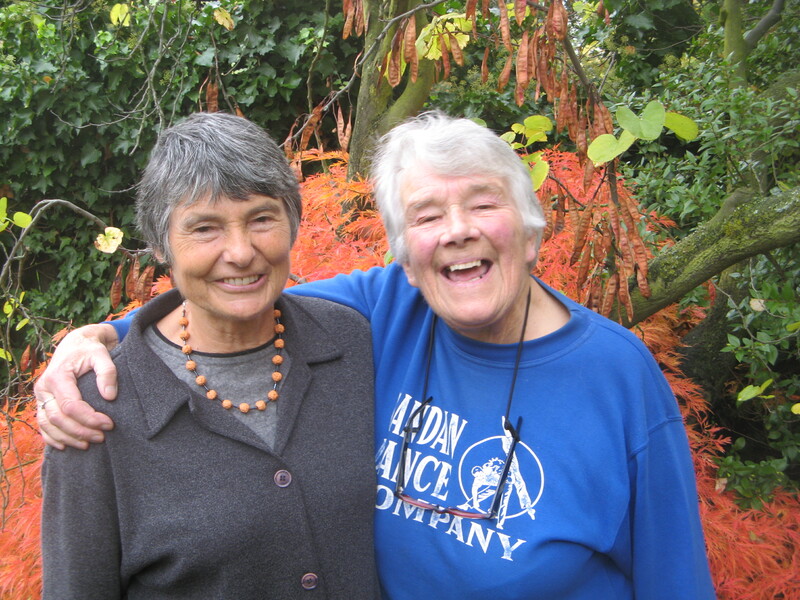 “For a world-famous author, Dervla Murphy is one of the most modest people you’ll ever meet. She hardly ever accepts speaking invitations, and when we persuaded her to be a keynote speaker at the Travellers’ Tales Festival, it was on condition that there would be two literary friends on stage with her, to keep the conversation flowing. We were also advised to provide a bottle of Guinness to help proceedings along – which we did, at 11 o’clock on a Sunday morning! In the event she was delightful, if a little shy, sitting on stage at the Royal Geographical Society in her walking boots, with the bottle in one hand, rather amazed at all the attention. She loved talking to the crowd, but more about the many places she has visited than about her own life and work.” I was there and remember the affection welling out from the capacity audience. But even such a distinguished writer is perceived as an old lady and treated according to cultural custom. I asked her if travel was easier now “you have grey hair”. “What I do find is that the old woman in our world, in the west, is just disregarded. In other countries you get more respect. In those countries – Africa and Cuba – I definitely noticed that life was easier. But in the west it’s the total opposite. It’s as if you’re simply not there”. Dervla Murphy has inspired so many travellers to push the boundaries of adventure and courage. The Guardian, Sept 2011, asked travel writers to choose the book that most inspired them. Robert Penn chose Full Tilt. “I started reading Full Tilt on a grey morning, wearing a grey suit, in a crowd of grey faces on the London underground. Several stops later I had raced with Dervla Murphy and her bicycle Rosinante from Dunkirk to Delhi and made the decision to quit my job as a lawyer and cycle round the world. Hear hear! Happy 80th birthday Dervla! Dervla Murphy was the second travel writer whoes books I had read in the early 80s. Since then I have been hooked. Being a computer into London for 33 years it has been travel writing that has swept me away into different cultures that I know I could only visit if I had more than one life. I have countless travel books in those years but Dervla Murphy reigns supreme. I have seen it written that she is able to get under a country’s skin, never a truer thing said. I would love to thank Dervla for the hours of pleasure she has passed on to us readers. I find it difficult to put into words what a unique person she is and to have the gift to convey her experiences in the way she has done is wonderful! Just finished “Ethiopia on a Mule”. I was a Peace Corps volunteer in Dabat. She must have passed through the town. It’s just south of Debarek on the road to Gondar, which she mentions in her book. If she passed through Dabat, I would love to know what she remembers of it. I will return to village for a visit in September as part of the Peace Corps’ “Return to Ethiopia” celebration of 50 years since the first volunteers went to work in Ethiopia. I hope Ms. Murphy is alive and well.